It's a personal preference, whether you use a garden cart, a wagon, or a wheelbarrow for hauling heavy or bulky items in and around your garden areas. When working around the garden, its always nice to have something to help do the heavy hauling. These garden workhorses can help you more easily move around or haul your bags of soil or mulch, those brick pavers, that flat of plants, or those large rocks. Below are the two items currently being used in the GQnE garden to move heavy loads around. The four wheeled cart was purchased with the idea that it would be the easiest one to use for hauling and moving things around. However, it was soon realized that the wheelbarrow actually maneuvers much easier and thus has become the most preferred for getting jobs done in and around the GQnE garden areas. Carts for garden use come in a variety of sizes and shapes. This cart is of foam construction and has a safety brake on the rear wheels. It also has a built-in tool tray with cupholder. The hauling capacity of this cart is 4 cu.ft. or about 200 lbs. 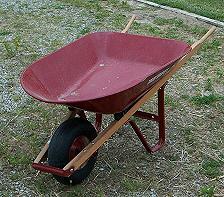 The wheelbarrow shown here is steel and has ash wood handles (to help support a strong, sturdy lift.) It has a 4 cu. ft. capacity tub with a working load limit of 80-100 lbs. 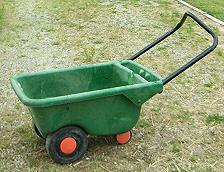 There is a wide selection of carts, wagons, and wheelbarrows available to choose from. Four-wheel carts and wagons are useful. Wheelbarrows come in both a single-wheel variety and a two-wheel model. The single-wheel type has a tendency to tip and thus requires a bit of strength and some sense of balance. Although the two-wheel type has greater stability and is less likely to tip, the turning radius will be different than that of the single-wheel variety. Again, as with many of the gardening implements you might use while working in your garden, personal preference plays a large part in choosing which of these garden workhorses you'll use to help you more easily move around some of those heavier items. Remember when looking for your hauling helper ... a bigger one may not be better if you have trouble moving and handling it. You're sure to find some type of wheelbarrow, cart or wagon to use as a garden workhorse and to help you haul things in and around your garden areas.